Feeling too hot during the summer and need a refreshing snack? Don’t worry, Living Kitchen has got your back! 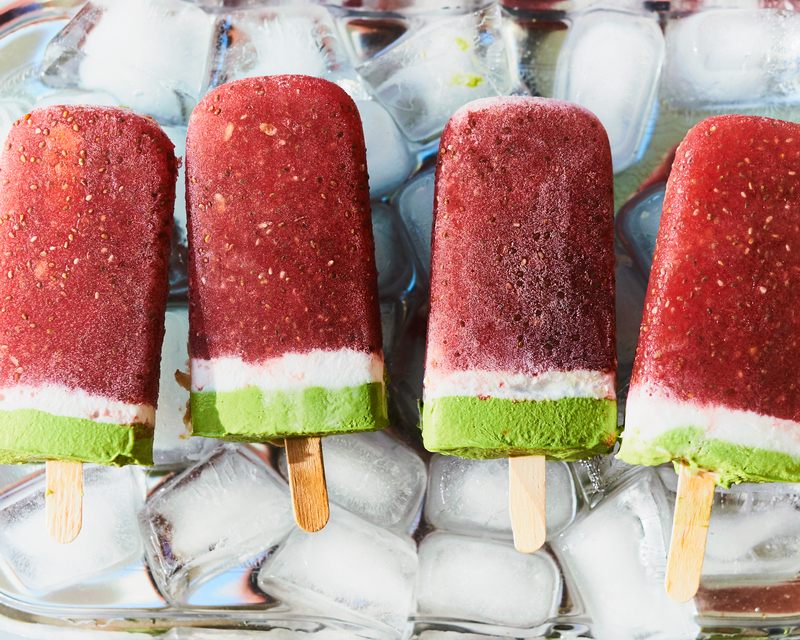 These vegan watermelon chia seed popsicles are absolutely delicious and refreshing. They are designed to look like a watermelon using different fruits and veggies. The bottom layer is made with watermelon, lemon juice and chia seeds. Chia seeds are an excellent source of protein, fiber, fat, calcium and magnesium. More importantly, they are loaded with antioxidants and are high in Omega 3 fatty acids. In fact, chia seeds contain more Omega 3 fatty acids than salmon, gram for gram! Chia seeds also contain a lot of calcium, in fact more than most dairy products gram for gram. This means that they are an excellent alternative to dairy for vegans, and anyone following a plant based diet, for calcium and bone development. Chia seeds are easy to add to your diet and can be included in almost anything to increase the nutritional value of the food. The chia seeds in these popsicles don’t just add nutritional value, but also a little crunch, basically hidden goodness! The middle layer of the popsicles is made of coconut milk and monk fruit (or you can use honey instead of monk fruit). The bottom layer, intended to look like the watermelon rind, is made with spinach, banana, and coconut milk. Popsicles are a delicious way to disguise your greens and get them into your daily diet! Spinach is an excellent superfood. It is a great source of iron, especially for those following a plant based diet who miss out on iron from meat. Spinach also contains calcium and magnesium, minerals that are important for bones and help with maintaining blood pressure. Spinach also contains the green pigment chlorophyll. A 2013 study showed that chlorophyll is effective at blocking some carcinogenic effects. Spinach also contains Vitamin A, which can help with healthy skin and hair, and is rich in vitamin C, which is critical for building collagen, a protein that’s responsible for giving skin strength. There are many other healthy ingredients in these popsicles, but enough about the health benefits, these popsicles are absolutely delicious! Get to your kitchen and make yourself some delicious popsicles while this hot weather is still going on. This recipe is completely dairy free, paleo friendly, gluten free and suitable for almost any type of diet. Add the watermelon and lemon juice to a blender and blend until smooth and liquidy. Pour the mixture into the popsicle molds (filling ¾ of the way full). Place the popsicle sticks in and freeze for about 3 hours to set. Rinse out the blender and add the 1/3 cup coconut milk, baby spinach, monk fruit or banana. Blend until smooth and creamy. Remove the watermelon popsicles from the freezer and pour a thin layer of the coconut milk mixture over top (don’t fill up completely). Place back in the freezer or another 30 minutes. Then pour the green coconut mixture over top to fill up the popsicles completely. Place back in the freezer until solid.